15 percent of commercial potting soil contains roundworm eggs. 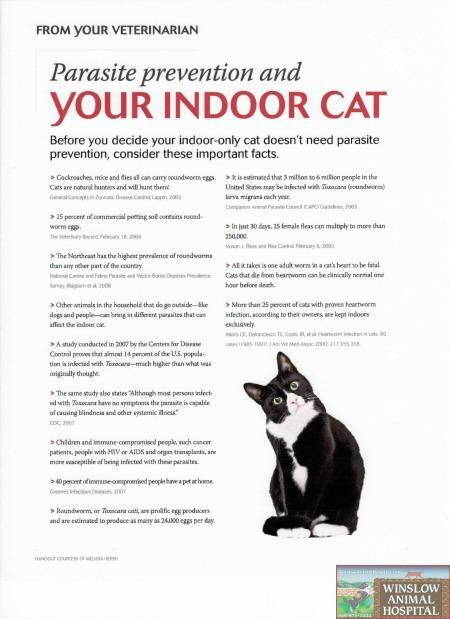 Other animals in the household that do go outside – like dogs and people – can bring in different parasites that can affect the indoor cat. A study conducted in 2007 by the CDC proves that almost 14 percent of the U.S. population is infected with Toxocara (Roundworms) – much higher than what was originally thought. Children and immune-compromised people, such as cancer patients, people with HIV or AIDS and organ transplants, are more susceptible to infection with these parasites. 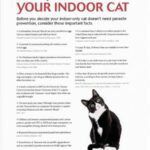 40 percent of immune-compromised people have a pet at home. It is estimated that 3 million to 6 million people in the United States may be infected with Toxocar larva migrans each year. All it takes is one adult worm in a cat’s heart to be fatal. Cats that die from heartworm can be clinically normal one hour before death. More than 25 percent of cats with proven heartworm infection, according to their owners, are kept indoors exclusively.